What if an infected doesn’t turn into a zombie as quickly as it is in most films of the genre? Right, there’s already a body horror flick titled Contracted (2013) which depicts the slow and gruesome transformation. But what if it’s a non-horror film that also shows the agony and dilemma of the infected’s loved one(s)? You mean like Amour (2012) or The Walking Dead (TV series)? Yes, so Maggie‘s basically like a cancer/terminal disease drama in a post-apocalyptic zombie premise. Don’t expect any full-fledged zombie action. It’s a slow-paced drama more than anything. Directed and written by feature film debutants Henry Hobson and John Scott III respectively, the film starts off like most post-apocalyptic films do — a quick and vague explanation to what’s happened to the world via the media. Much of the population have been infected by a virus that turns people in zombies (they don’t use this word in this film either). People are burning their plants and field to prevent the further spread, and like in Warm Bodies (2013) and The Last of Us (2013 video game), laws have been enforced with curfews and quarantine zones. The titular character, played by one-time Oscar nominee Abigail Breslin (The Call, Ender’s Game), is an infected who’s at the beginning stages of her transformation. It’s not clearly explained how she got her arm bitten or why they couldn’t just chop it off to prevent the virus from spreading. She ran away from home to keep her family safe from her and to hopefully not get sent to the quarantine where it’s rumoured that the infected aren’t treated humanely. After being arrested during curfew in the city, her protective father, Wade Vogel (Arnold Schwarzenegger), takes her home to spend her final weeks with her and refuses to let her go too early. But Maggie is gradually turning and inevitably, Wade will have a difficult decision to make and all options involve terminating Maggie (pun intended). Sounds like nothing you’ve never seen before? That’s because it’s not really original. And with the tone it has, we’d already know how it would likely end. The key thing for dramas is to be emotionally potent, but despite the good performances by Arnold and Breslin, the film fails to truly engage emotionally. The slow-moving narrative attempts to develop the characters and their relationship without showing their happier times in the past but the intended sweet and sad moments all seem too forced and, at times, it feels cheesy and unnatural, largely due its poor execution and unsophisticated script. Even the scene in the 2007 adaptation of I Am Legend where Will Smith kills his dog is far more heartwrenching. 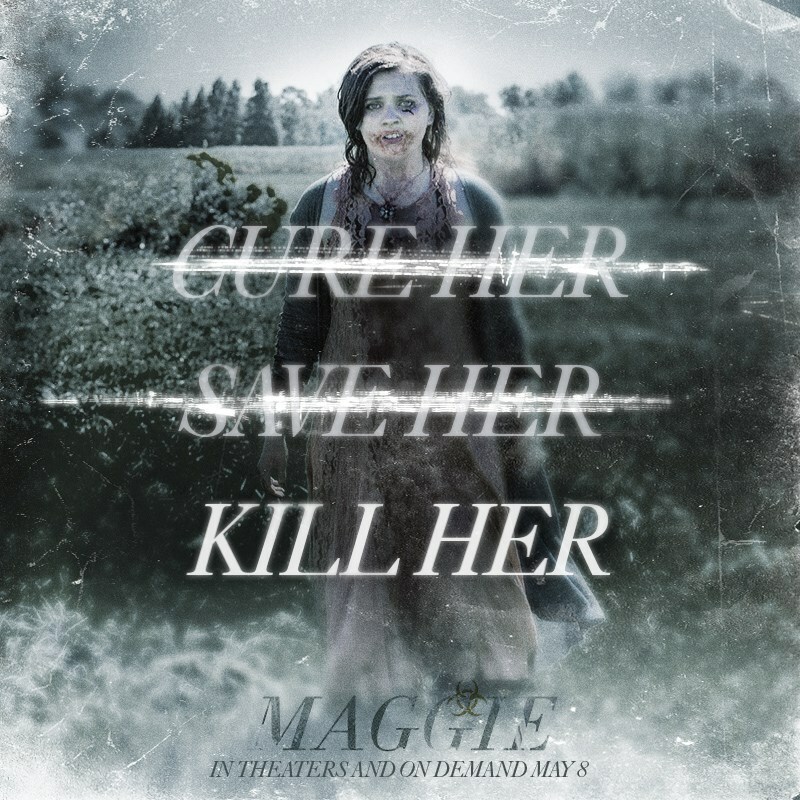 Also, the film doesn’t really show enough of Maggie’s hardship of being an infected — it’s like as though she’s already accepted and used to it, just waiting to die and only hoping that it would not be at the quarantine. It makes it harder to sympathise with her. 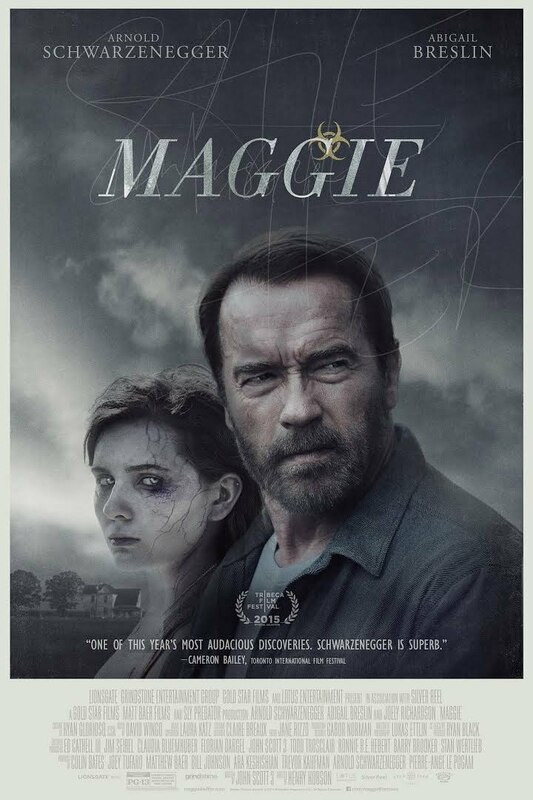 Unlike terminal disease dramas like The Fault in Our Stars (2014), it’s pleasing that Maggie also focuses heavily on the point of view of the dying character’s loved ones, which makes it more relatable. Unfortunately, the badly executed abrupt ending is neither thought-provokingly defining, tear-jerking, shocking nor even scary. Some may even think it’s dumb. The very last scene shows Maggie walking out through the front door of their two/three storey house but somehow she ends up on the roof where she jumps off as though that height would be enough to kill her. All that would’ve been forgivable if the film actually carries any message or valuable teachings that’s not already been done better before in other similarly themed films. 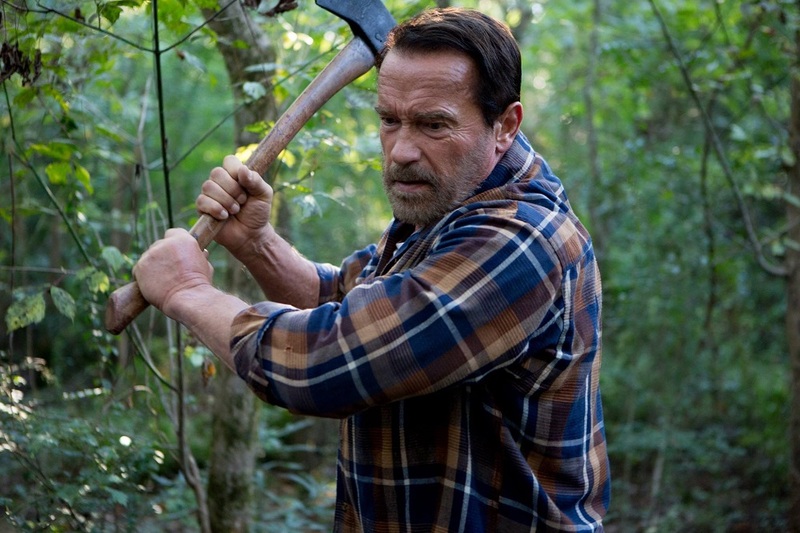 Arnold is arguably one of the top action stars of all time, but he’s never known as a great actor and this is perhaps the first and only non-action or comedy movie that features him in the leading role. The Governator manages to showcase his emotional depth as this loving father who’s well aware of what’s going to happen, but ignores all warnings and keeps his daughter anyway. With that being said, it’s probably even his best acting performance ever. I find myself pitying Arnold’s wasted effort instead of the characters. With a better writing and tighter direction, this beautifully shot film could’ve been something. Malaysia censorship: Paid to watch this. There are some graphic scenes and a mild teenage kiss, but none of them is cut despite being only classified as P13, which is good. There’s a short dialogue about god at the beginning but strangely that subject never comes up again after that. Not sure if it’s due to local censorship, or just pure uneven screenplay. 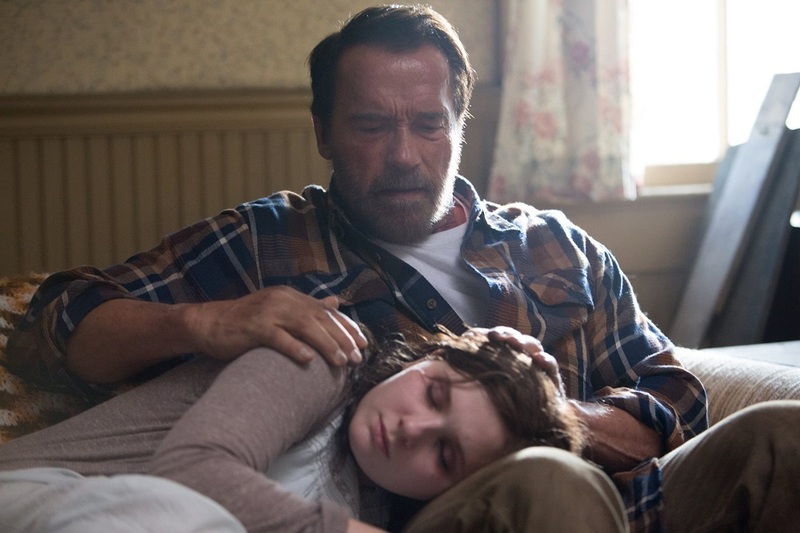 Second opinion: My girlfriend thought that Arnold does deliver as a loving father, but agrees that the film doesn’t really have enough feels. Verdict: Arnold fans would enjoy his presence but the film is slow and yet not really emotionally potent with nothing new to say at all.